This afternoon we held a joint meeting of the Prince George’s County Council and our Council’s transportation committees. We discussed the Purple Line, bus rapid transit and the state commission’s recommendations to raise some $800 million in transportation funds. I made the point that the Purple Line will be a game changer for economic development as it connects our 355/270 corridor and the Red Line there with Silver Spring, UMD and New Carrollton – on up to NYC. Plus a few more Metro lines in PG and some MARC lines to boot. Regionally the Purple Line is our most critical transportation priority and our two counties, which suffer from heavy traffic and will pay a huge share of the needed gas tax increase, should insist on a funding commitment this year in the legislature. If we support the gas tax together then let’s get the Purple Line together! 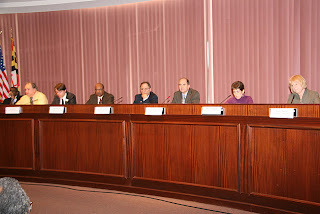 The photo shows us at the WSSC board chamber where we sometimes meet when it is a joint function.